88 flak gun (why did I even bother with that description?) Panthers lurk. I'm more than a little cheesed off this week-end. I was intending to head up to Mr Lander's in order to have a bit of a laugh, take lots of napoleonic pics and get in a game of crossfire with John's 1/35th collection. However, John had to unexpectedly work this weekend, so we've put it back to next week. Subsequently all you napoleonic fans will have to wait for the planned pictures of John's Russian collection. 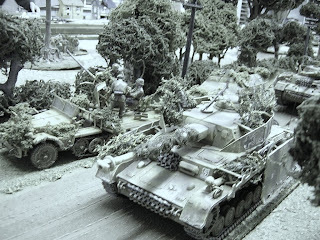 As a substitute I've put up a series of pics from a game we had a few years ago now, at the WHC using John's 1/35th kit. Many of you will be familar with his stuff from seeing the 2 demo games he has put on at Salute in the last 3 years (Sword beach and Market Garden). This was a prelimary game to D-Day where we tested out some rules and was an excuse to get the toys out. John wanted to try things out on a bigger table, so asked Gerry if we could come up and try it out there. 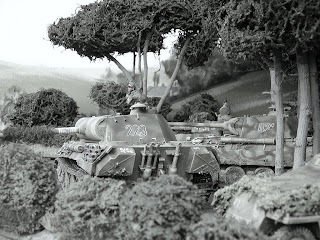 Ged was champing at the bit to get his hands on some big panzers so off we went and the ensuing battle of Cagny was the result. John wrote this up for an article in Wargames Illustrated in April 2006, so there are more pics there if you can find it, and detailed account of the game. 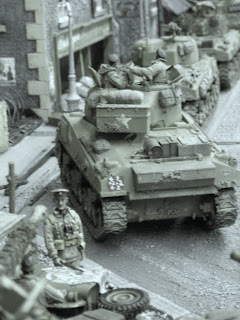 Shermans wait for the order "Driver Advance!" John's talents (and some would say; obsession) with his 1/35th stuff is pretty extraordinary. I really keep working hard to get him back on the path of Napoleonic righteousness, so far, not much luck, but I will....just you see. It's not just the figures and vehicles that are John's work here, he did all the buildings from scratch as well. I've put in some B&W versions so you can see just how realistic some of this stuff is. Right! after that amount of arse-licking if I don't win the game next week, I'll give up!